Issue #216 is actually a little unsettling in the context of the attack in Boston in 2013. It’s about a criminal planning an attack on a runner during a race, and it’s called “Marathon.” Madame Web helps him identify the sniper, and as the issue goes on Spider-Man intervenes a few times–like when a runner accidentally falls off the Manhattan Bridge. It’s a pretty simple tale that has fairly simple suspense build-up. The cute thing is that, at the end, Spider-Man figures out that that “race” in question was not the NYC Marathon–it was a local political race. He saves a politician, and the race ends without incident. One of Denny O’Neil’s better Spidey tales. 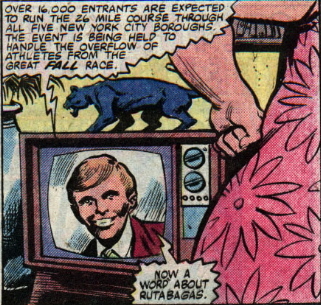 But the really surprising thing: Who know that back in 1981 they had TV ads for rutabagas?